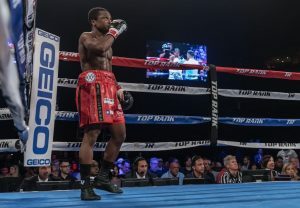 Isaac Dogboe’s upcoming 122-pound title defense versus Emanuel Navarrete was secured and announced long ago, but the pairing has suddenly taking on a new dynamic. The December 8 clash serves as the chief support to the lightweight title unification bout between Vasyl Lomachenko and Jose Pedraza, with both fights airing live on ESPN from MSG’s Hulu Theatre in New York City. What was believed to be an optional defense for Dogboe, however, has now been classified as a mandatory title fight which—with a win—will open up his 2019 schedule. The ruling came about during the World Boxing Organization’s (WBO) annual convention this week, recognizing Navarrete (25-1, 22KOs) as the leading available contender for Dogboe’s title. The 23-year old from Mexico City is ranked number two by the organization, right behind countryman and unbeaten contender Diego de la Hoya. However, de la Hoya (21-0, 10KOs) and his team—which includes his first cousin and promoter, Hall of Fame former six-division titlist Oscar de la Hoya—decided a bit more grooming was required before chasing a title. The 24-year old from Mexicali, Mexico will instead fight in his hometown for the first time in his career—along with his first pro fight in Mexico in general—in a November 17 showcase headliner versus Venezuela’s Edixon Perez. The decision came with the understanding that the winner of Dogboe-Navarrete will not be obligated to make a mandatory title defense until September 2019, a decision that came with de la Hoya’s blessing. Should Dogboe prevail on December 8, it gives him plenty of room for an active 2019 campaign that could very well include a homecoming title defense in his native Ghana. Such plans were part of his agreeing to a long-term co-promotional pact with Top Rank, under whose umbrella the unbeaten 24-year has fought since winning the title over Jessie Magdaleno earlier this year. The upcoming title defense versus Navarrette will already mark his fourth fight of 2018, all carrying title fight implications. Dogboe (20-0, 14KOs) burst onto the scene in the first significant fight of 2018, stopping Cesar Juarez in the the 5th round of their interim title fight this past January in Accra, Ghana. It marked his 10th appearance in his home country, but also the last for the time being with his upcoming bout with Navarrete marking his third straight in the United States. The win over Magdaleno—with both boxers hitting the canvas before Dogboe prevailed in the 11th round of their ESPN-televised thriller—marked his arrival as a major player in the 122-pound division, rising from adversity to bump off a previously unbeaten titlist. The feat came with the understanding that he’d inherit a mandatory challenger in Hidenori Otake. Dogboe gladly obliged, destroying Japan’s Otake inside of one round this past August, also on ESPN where he has become a network favorite. He’s also quickly become a favorite of Hall of Fame promoter Bob Arum, who remains eager to expand the boxer’s horizons. Providing he continues his winning ways in December, the sky’s the limit—at least for the next nine months, thereafter.